I am cross-posting from my dianadyer.com blog (below the photo), so you can see what my husband and I are up to these days. To bring you all up to date, in a nutshell, just over a year ago my husband and I bought some foreclosed property (with a home that needed serious repairs) to start a small organic farm, focusing initially on garlic. We spent all of last summer deciding how to get started with the growing of our garlic, got 40 varieties planted last fall, then started getting nature out of the house (plants and animal) plus the repairs and remodeling of the house all winter and spring of this year, began harvesting in early May with "green garlic", have just started harvesting garlic scapes (the 'stem' that hard-neck varieties of garlic sent up after their leaves are all up - which should be cut off to encourage larger bulbs underground), and will be harvesting the bulbs beginning in July. Since we sold all the May green garlic to Zingerman's Deli, The Grange Kitchen & Bar, and Pastabilities, all in Ann Arbor, MI, we never got to the farmers' markets with our first crop! We decided to start with the farmers' markets when our garlic scapes came in and then sell to the chefs second, because we want the fun and pleasure of being part of the local foods community at the markets, which had been our initial goal. 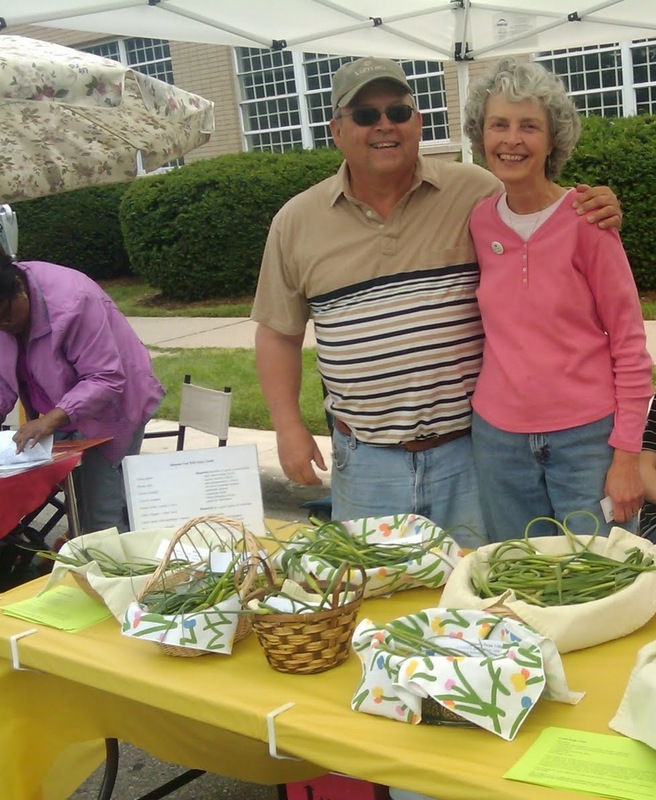 My husband and I grinning like little kids on Christmas morning on our debut day as vendors selling our garlic scapes (7 varieties this week - 15 varieties will be ready for week #2) at the Ypsilanti Downtown Farmers' Market June 8, 2010 - photo taken by Cara Rosaen, Marketing Director for the brand new website RealTimeFarms.com. 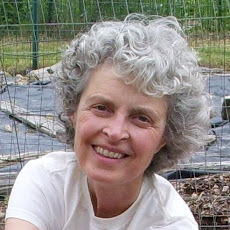 Please check out the RealTimeFarms.com website - it is designed to connect people to fresh, local sources of food by providing "real time" information (including beautiful photographs) about the location of farmers' markets around the country along with what is available to purchase today, right now, , i.e. "real time". It is an interactive site that you (yes, you!) can also use to load up information about what you see available at farmers' markets where you live. Unlike grinning kids who have the pleasure of having gifts just appear on Christmas morning, my husband and I fully appreciate every aspect of both the years of hard work leading up to this moment and our extreme good fortune to have arrived at this moment. I just turned down a cancer survivorship speaking invitation because I am too busy farming, but that does not mean I have forgotten "where I have come from" to get here. I am a very grateful cancer survivor every single day, hoping that I can still help others plant and cultivate their own seeds leading to a successful survivorship journey, too.